In my quest for trying to understand why so many people hate PowerPoint (and even I sometimes hate it), I have come to the conclusion that a key reason is that when working with PowerPoint most people are racing against the clock. 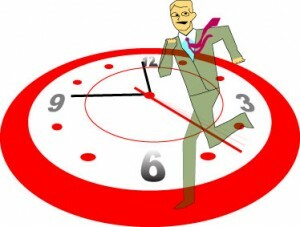 It sometimes seems that when working with PowerPoint, the clock just starts racing ahead to that presentation deadline. They don’t really hate PowerPoint, but the deadline and what they have to do to get to the deadline. Then, to top it off they have get up in front of a group and present their story or critical information, a task often feared as much as going to the dentist for a root canal surgery. A presentation deadline is like no other. It is often a one shot deal. One shot to make and win your point. It is often a deadline that you can not delay or change. Getting a group of people together, often a group of important people or large group of people to meet these days is a challenge in itself. Wasting your own time is one thing, wasting other people’s time is magnified tenfold by the potential loss or gain of the meeting outcome. A good presentation often takes a great deal of time to develop and design. It is my experience that most people don’t PLAN enough time for a good PowerPoint presentation. The best presenters plan more than enough time and are so well rehearsed, that when they finally present they look so good, as if they never have to rehearse. Before PowerPoint (Keynote, and other electronic slide applications) presentations used to take a lot longer to develop and a minimum of 24 hours to get the “slides”, the 35 mm slides or color overheads (acetates) processed. You could not make last minute edits the way you can now. With the power of PowerPoint, you can make changes to your presentation slides right up to the second before you are about to present. This is great to be able to update last minute data, fix a typo, or add a last minute important thought, but it also adds to the stress of time. The production is not done until you present it. I’d write more, but I have to go plan my next presentation.